The Catholic Hipster weblog: Who Are Your Catholic Hipster of the Year Nominees? 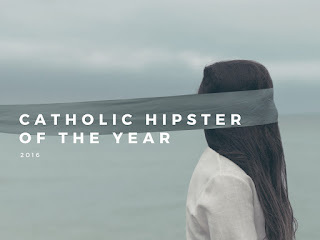 Who Are Your Catholic Hipster of the Year Nominees? We are now just a few weeks away from kicking off the third annual Catholic Hipster of the Year contest (affectionately known as the Wojtys!)!! On Christmas Eve, we will open up the voting to add another amazing hipster to the ranks of Anna Mitchell (2014) and John Leyendecker (2015). This year, we're asking all of our 6 loyal readers to let us know who they think should be on the short list this time around. To get an idea of what we're looking for, here is our crop of candidates from 2014, and here is our crop from last year. So, my friends, hit us up and let us know who you'd like to see in the running for this year's Catholic Hipster of the Year! The Catholic Conspiracy, but then, I'm kinda biased. But in a good way.